Ugly cork board? Spray paint it, of course! Is there any problem spray paint doesn’t solve? Not at our house, there isn’t. Okay, maybe that’s an exaggeration…it’s not going to help with the leaky toilet. But otherwise? It’s my best friend. I picked up a cheap cork board from a yardsale for my office and painted the black frame a minty green. But the tan/brown color of the cork really wasn’t doing anything for me. The color just didn’t go with the mint, or my office. 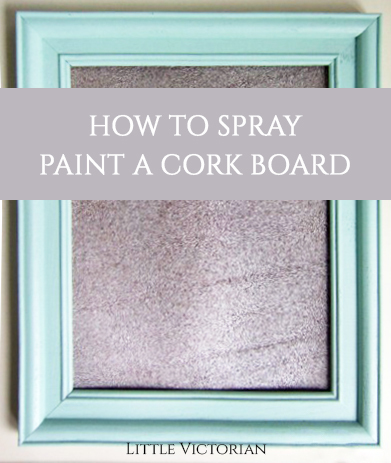 I Googled “spray painting cork” but there were so many varying opinions on whether it could or should be done, I just decided to go for it and see what happened for myself. If it failed, I was only out a couple dollars anyway. First, I’ll give you the tutorial on how to spray paint a cork board, then I’ll give my thoughts at the end. I was NOT excited about the pin holes showing everywhere, but thought it might be better after a couple more light coats. It’s important to do light coats. If you spray it on too thick at once, the paint will peel off easily. Having finished the project, would I recommend painting cork? Absolutely. Just not in white. Unless you can manage 2 very light and VERY even coats. The contrast is way to high once a pin is pushed into it and it just looks silly. It looks like a DIY. 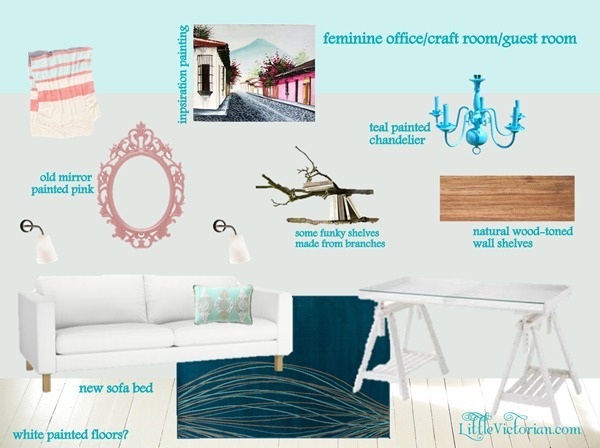 We don’t want our projects to look like DIYs, we want them to look like things we paid a lot of money for. Am I right? White painted cork board is not going to give you that look. So what would I recommend? A color with much less contrast to the brown, and still, just a couple light, even coats. Like gold. Metallic Caramel Latte by Krylon is what I used, but any color that’s closer to the original cork board than white should be fine. Bonus points for metallic (not just because it’s pretty, but because it will reflect the light in different directions, further hiding the pin holes). Since painting my first cork board white was a flop, I made a new one. Starting with a pretty wood frame from Goodwill, I removed the glass and painted the frame the same mint green. Then instead of putting the glass back in, I cut a section of cork (like this) to size and then put the cardboard backing back in the frame to hold it in place. Craftsy now offers all of their courses free for the first week. They’re good too. Spray painting the cork gold (or another color that is low-contrast) allowed for less coats, which left more of the lovely cork texture visible. The brown cork color still comes through in low spots, which helps with pin marks. I stuck it with a few pins and the marks are not visible at all. Whoa! that golden and bit uneven finish is just excellent! You did an amazing experiment here. Thank you. I didn’t really like the lines at first, but the Hubs said it added a lot to the look. Love it! Super crafty. So easy to make cork look so much better. Along those lines, did you happen to seeOrlando’s painted bulletin board? I think I will try your version first. Thanks for the great pics. How funny! I had not seen his yet, and it’s a great idea. I think covering my cork with fabric will work better than painting for my application. Thanks for the idea. You’re welcome! Let me know if you try it. This is just what I was looking for! I’m going to try the metallic. Thank you! Cute! I’m going to use the same metallic on mine and I’m glad I read this because I was going to do white also. What did you use to paint the frame? Did it come that mint color? It looks good. Thank you very much! The frame was originally black. 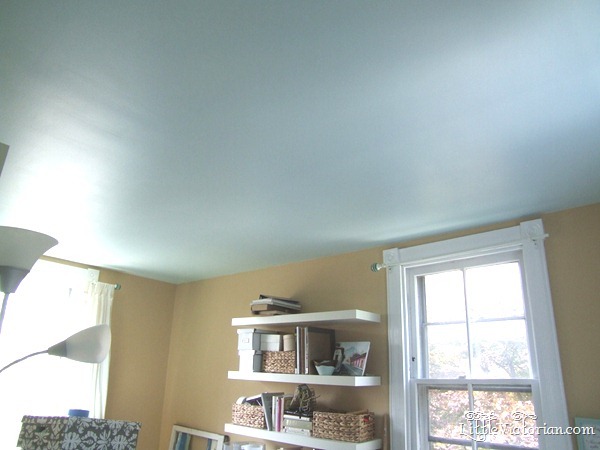 To paint it, I used latex wall paint that I had left from another project. Any paint should work for the frame, as long as you give it a light sanding and a coat of primer. Come back when you’re finished and let me know how it goes! P.S. Little stud earrings make really cute push pins. Sometimes I buy a big pack of studs and only want a couple of the pairs to actually wear so I enjoy getting some use out of the other ones as fancy push pins! That is brilliant, I love it! Thank you for the info! My husband gave me an old cork board for my new home office. The cork is faded w/old postings, bleached by sun. I said I wanted to paint it & he said I can’t paint cork. HA. I beg to differ!! The dark paint will be perfect w/ my brown wall. I’m actually attempting this (even stole the light blue outside… mines light blue at least yours may be slightly more minty…)this weekend! It’s going to be warm enough to paint! How long did you wait between spray coats? Excellent! I waited about 10 minutes between coats. Feel free to share pictures! Hi there, found this page and I just love the idea! I’m definitely going to try this! My bulletin board has already been printed black. What do you think? 2 coats of a semi-dark color should do? Yep, I’d go with two light coats. Feel free to come back and let me know how it went! Good question, I would not recommend painting it white first. What makes the darker paints work is that it blends in with the brown background. Have fun and feel free to come back and let me know how it went! I appreciate such great information and help. My cork board is already cream colored. What would be your recommendation for painting it. Thank you so very much. I’d still go with a color closer to the natural cork to hide the little holes. Have fun! My question is would chalkboard paint (black) work on cork? ?! My daughter wants to make Christmas coasters to sell on her youth club stall. Should she put a sealant on top? Yes, if they are going to be used as coasters and not have pins stuck in them, they should be sealed. Otherwise the paint might peel off when it got wet.